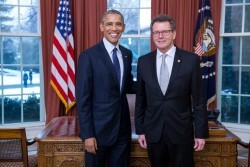 Ambassador Wolfgang Waldner presented his credentials to President Barack Obama on Thursday January 28, 2016. "I am looking forward to my upcoming tasks, especially to be part of the successful bilateral relationship our two countries share. It will be my honor to further strengthen the political, economic, and cultural bonds between the United States and Austria over the course of the next four years." Waldner said at the White House. Ambassador to the U.S. Dr. Hans Peter Manz will leave Washington and return to Vienna upon completion of his four year mission. Hans Peter Manz has served as Austria’s ambassador to the United States in Washington, D.C., from December 2011 to December 2015. Before moving to the U.S., Dr. Manz was the Austrian Ambassador to Switzerland. During his diplomatic career, Dr. Manz served in a variety of positions, including inter alia, foreign policy advisor to the Chancellor of Austria. His overseas postings included Tehran, Bern and New York. Ambassador Manz will be succeeded by Ambassador Wolfgang Waldner.